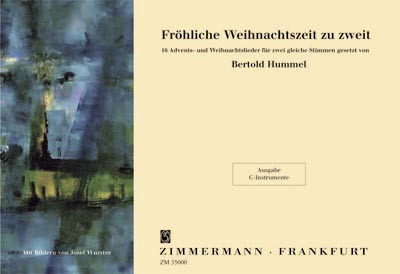 Making music at Christmas time was natural for Bertold Hummel throughout his life. As a chorister in his father's school choir, as the precentor in his Freiburg parish, as a cellist or as a happy father at the piano, he always enjoyed taking an active part in the Christmas festivities. As a composer, he enjoyed writing new settings for the old Christmas carols and wrote numerous compositions ranging from simple choral pieces to chamber and orchestral music and even to the large-scale choral fantasia "O du fröhliche Weihnachtszeit" for 2 choirs, 4 organs, trumpets and trombones - works with which he moved many people. It was a moving experience for us when last summer, after a full life with an immense creative output of over 200 compositions in all musical genres, he wrote these settings of Christmas carols as his last work. As if he were returning to the essentials, he once again set himself the challenge of bringing a melody to life with only one counterpart. We are glad to see that Musikverlag Zimmermann had the idea of illustrating this little work with wonderful pictures by Sepp Wurster. My father made the acquaintance of this versatile artist during his studies in Freiburg. With mutual admiration for the creations of their imaginations they built up a friendship that lasted a lifetime and can now be documented artistically here in print for the first time. We wish all who play and sing these carols a merry Christmas.